At Titan Tube we pride ourselves on being more than just a tube fabricator. Our engineering department thrives on helping customers with problem solving on difficult applications. Whether it’s making improvements to enhance product performance or reduce cost, Titan can use its years of experience and SolidWorks software to develop cost effective solutions. 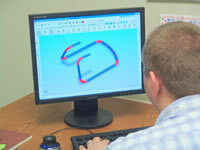 From prototypes to production, our engineering software and expertise brings tremendous value to our customers. The SolidWorks software has the capability of converting customer supplied drawings into X, Y, Z data that is imported directly into the benders. We can also run software to determine cycle times and interference points. This reduces lead times and scrap on start up which results in improved delivery service and lower costs for our customers.